One of my most memorable surfing experiences, and possibly one of the most dangerous, occurred at Fort Point in 1973: an unusual surf spot located underneath the Golden Gate bridge in San Francisco. At that time it was owned and patrolled by the US Army from the nearby Presidio. I recall seeing an article on Fort Point in the newspaper and we decided to check it out. I’ll never forget that first morning: when we arrived it was just getting light and the ocean was completely flat. 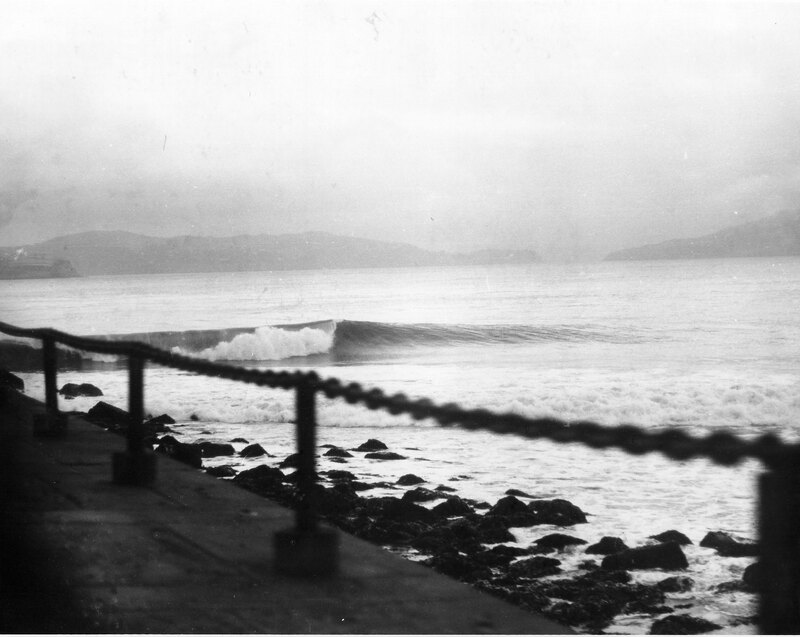 However, after a few minutes swells started swinging around under the bridge and this perfect left break unfolded! I don’t remember ever putting on my wetsuit faster! It was a really nice tubular break, although you had to be careful about avoiding the rocks and the swift current running under the bridge, which was a one-way trip to the open ocean. We have an incredible time surfing and went back many times over the next few months. We rarely saw anyone else surfing there. However, the MPs (military police) were an ongoing problem. My friends (mostly Jeff Chamberlain and Sam George) and I would wait until the MPs completed their hourly patrol, then we would paddle out for some quick waves. 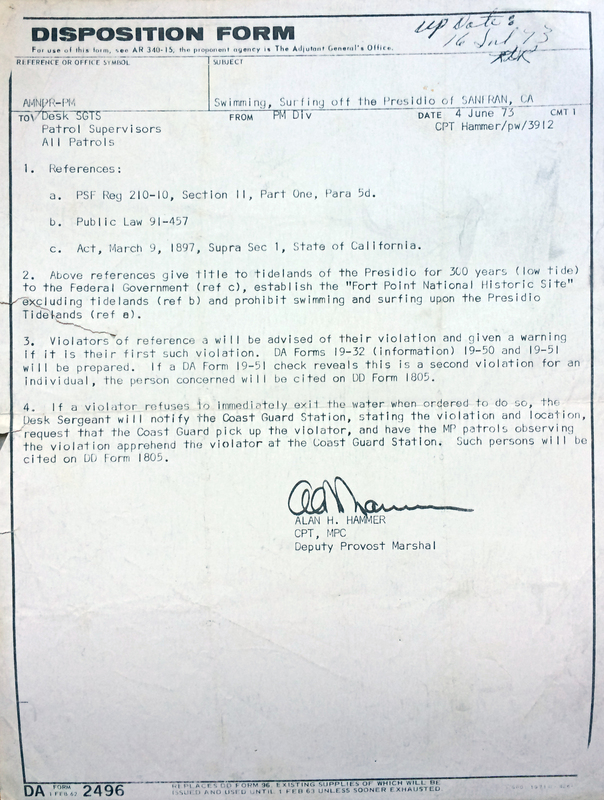 Eventually we got caught and after repeated offenses Jeff and I were arrested for “trespassing on military property for purposes unlawful” which was a federal crime. I ended up in Federal court but in the end the Army dropped the charges and Fort Point was turned over to the Park Service whereby it became legal to surf. I guess being owned by the Army had its advantages. We filmed the arrests and it is near the end of my Fort Point movie on YouTube, which is posted below. In mid-1974 I moved to the east coast and was surprised when I returned a year later to see how crowded the spot had become. It is also an amazing place to watch when the waves are big as they break directly underneath the bridge. I never surfed it under those conditions and am not sure I want to. Busted at Fort Point, 1973. Being taken away by the MPs. 1973.